Sea potatoes are native to the coasts of Korea and Japan. During a class field trip to Mackerel Cove in Jamestown, R.I., in 2017, University of Rhode Island student Jacob Reilly picked up an unusual brown seaweed that looked like a hollow ball and asked his professor what it was. The answer was a surprise. 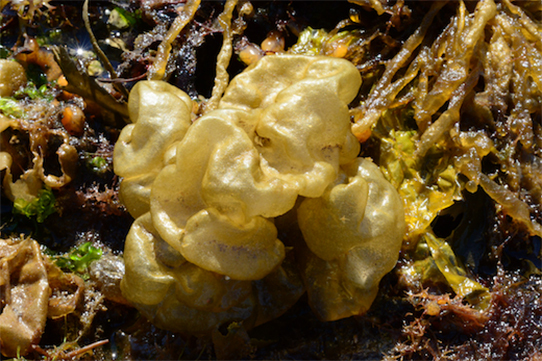 Reilly had stumbled upon the first appearance in Rhode Island of what has come to be called sea potatoes (Colpomenia peregrina), an invasive seaweed native to the coast of Korea and Japan that grows on top of other seaweeds. Green-Gavrielidis has a history with the invader. Sea potatoes had been unintentionally introduced to Europe sometime in the early 1900s, probably in ship ballast, and from there it made its way to Nova Scotia in the 1960s. It took until 2010 for it to be discovered in the Gulf of Maine, when Green-Gavrielidis found it while conducting research for her doctorate at the University of New Hampshire. The appearance of sea potatoes along the Rhode Island coast is significant because it has crossed what Green-Gavrielidis calls a major biogeography boundary: Cape Cod. The waters to the north of Cape Cod are dominated by the Labrador Current from Greenland, which makes for colder, more nutrient-rich waters. South of the Cape is dominated by the warm Gulf Stream. To determine how common sea potatoes are in Rhode Island waters, Green-Gavrielidis conducted a methodical search for it at 13 sites along the state’s coastline last year and conducted several quantitative surveys to compare its abundance to a similar native species called sea cauliflower. The research was published last month in the journal BioInvasions Records. In addition to Mackerel Cove, sea potatoes were also found at East Beach and Ninigret Pond in Charlestown and South Ferry Beach in Narragansett. It wasn’t found any further north in Narragansett Bay than South Ferry Beach, perhaps because the native seaweed it is most commonly associated with, rockweed, is not found in abundance in the upper bay. No sea potatoes were found in Westerly or eastern Connecticut, either, so it hasn’t likely found its way into Long Island Sound yet. “The biomass we found in Rhode Island is much lower than what we found in the Gulf of Maine, so maybe it hasn’t been here as long,” Green-Gavrielidis said. “That might also be because the environmental conditions are such that it’s not doing so well here. We do have some preliminary data that shows that there are herbivores — snails primarily — that eat it, so that’s good. That’s a good sign, since there is little that can be done to stop it. Green-Gavrielidis and URI colleague Niels-Viggo Hobbs will be conducting a new research project this summer and fall that involves sampling rockweed habitats — the native seaweed most closely associated with the sea potato invasion — so they will be keeping an eye out for the newly arrived seaweed. Their students are also conducting laboratory studies to determine whether native seaweed-eating marine life will eat it and if it is preferred over native seaweeds.